Cause: Something is turned off. It could be the water meter, main gate valve to irrigation system, or an individual valve’s flow control stem. Solution: Make sure system is on. Check each of the causes. Cause: Controller program or current day/time is incorrect. Cause: Wiring between the valve and controller is not connected or making contact. Solution: Check the wire connections at the valves and at the controller. Use waterproof wire connections. Cause: Solenoid may be defective. Solution: If the valve can be turned on manually but not electrically, replace the solenoid. Cause: There is debris in the valve. Solution: Use the external bleed screw to flush the valve. If debris is significant, the valve may need to be disassembled and cleaned. Cause: When some valve diaphragms tear, they do not allow watering. Solution: Open the valve and replace the diaphragm. Cause: The controller may be programmed incorrectly. Solution: Check the controller schedule. Cause: There is a damaged or cracked valve bonnet (valve top) and/or body. Solution: Look for cracks in the valve and replace as needed. Cause: When some valve diaphragms tear, water will not shut off. Cause: Could be a broken pipe. Solution: Remove dirt and plant material to expose broken pipe, then repair. Cause: Pressure is too high. Solution: The flow control stem on the valve enables you to restrict flow by 10% which could bring the pressure down a little or you may need to install a pressure reducer at the house or a pressure regulator in the sprinklers (review sprinkler section). There’s no need to cut a moat around your sprinkler head if they pop up high enough. Use 6" pop-up heads in this situation. Cause: Dirt is jamming the riser. Solution: Remove cap and guts and flush out. Cause: There is not enough water pressure. Solution: Change to smaller flow nozzles/check the sprinkler nozzle for debris. May need to consider adding another valve. Cause: Valve or system has a flow restriction. Solution: Ensure the valve and the system is fully open. Cause: There is a damaged riser or riser seal. Solution: Replace sprinkler inner components. Cause: There is a damaged retraction spring. Solution: Replace sprinkler inner components, especially the retraction spring. Cause: Sprinkler is tilted, sunken. Cause: There is a shorter than desired throw. Solution: Check the filter and clean. Replace the nozzles with the correct nozzle distance. Cause: Does not water in the desired pattern. Spray: Replace the nozzles with high efficiency variable arc nozzles. Cause: Pressure is too low. Solution: Either reduce the flow rate out of every sprinkler in the zone by replacing the nozzles with those with a lower flow rate, or install a new zone to split the existing zone. 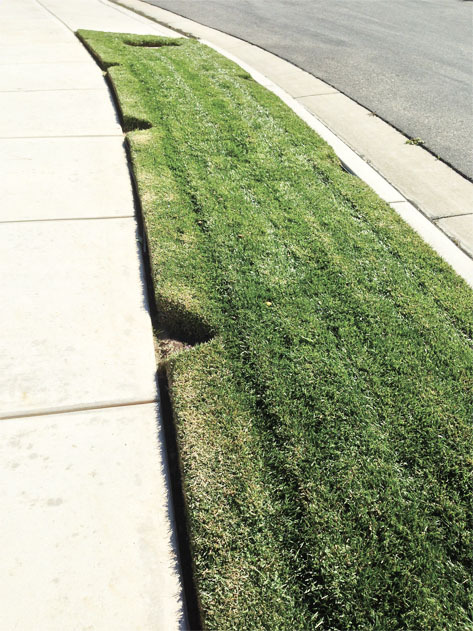 Cause: There is low head drainage especially on sloped areas. Solution: Replace sprinkler inner components with “check valves” in the stem of each sprinkler within the zone. Solution: Replace sprinkler inner components with pressure regulation in the stem. Cause: Plugged or broken sprinklers, improper sprinkler layout. Solution: Verify with the catch can test. Fix or replace broken or plugged sprinklers. If the sprinkler layout was installed incorrectly, it will need to be changed. There are numerous videos online demonstrating a "catch can test." Cause: Spray sprinklers and rotors/multi-stream rotating nozzles on the same zone. Solution: Replace so that all nozzles are the same type and from the same manufacturer. Cause: Not enough water getting to the plants due to plants having grown since the drip was installed. Solution: Watch the system run then add additional emitters. Cause: Water is not getting to a section of the yard. Solution: Check for and repair leaks and breaks. Cause: Check to see that the valve is open and able to operate. Solution: Ensure that the entire system is operational. Cause: Check to see that the filter is clean. Cause: Look at the amount of run time on the controller. Solution: Manually run the zone for the amount of minutes scheduled on the controller. Watch to see the wetted patterns around the plants. If the plants are not getting enough water, increase the run time by five or ten minutes and observe. Your goal should be to wet enough area so roots will have room to grow. Cause: Pressure may be too high, fittings may not be the correct type (barbed vs. compression). Solution: Install pressure regulator if necessary; replace fittings with correct ones. Cause: Animals or gardening tools have punctured the tubing. Solution: Cut out damaged portion and replace with correct connectors. Solution: Be sure a pressure regulator is installed. Solution: Replace emitter. If using dripline tubing, a new emitter can be punched in near to plugged one. Cause: The date and time are incorrect. Solution: Follow the manufacturer’s directions to set the correct time and day. Cause: The controller programs are set incorrectly. Solution: Verify the controller programming. Cause: The controller and/or valve wire and connections may be damaged. Solution: Inspect the connections and use waterproof wire connectors. Cause: Either the valve or the system is shut off. Cause: Controller is not programmed correctly. Solution: Verify the controller programing.